Wondering how to steam clams to use in chowder, stuffed clams, and other recipes? Sure, you can used canned clams as a substitute - but once you try these easy steps for steaming clams, you may never open a can again! Crispy/crunchy on the outside and flavorful inside, these yummy fritters taste especially good when you dip them in a little malt vinegar or hot sauce. Tartar sauce and a splash of lemon also hit the spot! 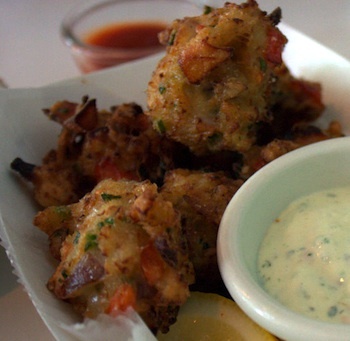 Our clam fritters recipe takes only a few minutes to mix together - in fact, you can do it while you heat the oil. Because they're fried in oil, this isn't our healthiest recipe - but they're a huge hit at parties! Makes about 3 dozen small fritters. If you serve them at parties, count on most people eating at least 3 - maybe more - so you may need to double the recipe. Note: You can use fresh clams, shucked clams, or canned clams. Although fritters made from fresh clams taste divine, they're also very good when you use canned clams. Truthfully, we usually use canned clams because of the convenience. For this recipe, 2 6-ounce cans isn't quite enough, so we usually use 3, which comes out about right. Heat about 2 inches of oil in a large, deep frying pan to 370°. Mix together the olive oil and egg in a small bowl. Mix in the clam juice and milk. Combine the flour, baking powder, salt, pepper, and cayenne in a large bowl. Whisk in the egg mixture. Stir in the clams. Dip a teaspoon into the hot oil to coat it. Take a rounded spoonful of the clam fritter mixture, and carefully slide it into the oil. Let it cook for 2-3 minutes, or until it turns golden brown. Remove it with tongs, drain it on paper towels, and when it's cool enough to eat, taste it to check the seasoning. (The cook's reward!) Add more salt if necessary to the remaining batter. Now, continue to fry the fritters, perhaps 5 or 6 at a time, until you've used up all the batter. Serve immediately. Actually, they smell so good, you won't have a choice - everyone will be trying to grab them straight out of the frying pan.